The Jarvis Hotel provided a 'Meeting Room' where some members of the Palers' Band took the opportunity to run through a tune or two. The tireless Dave Godfrey sorts out some cables; Tito rubs shoulders with an overhead projector. Saturday morning, and to everyone's relief Larry beats the 'plane problem and takes his place at the organ. Peter and Richard look on as Dave does his stuff again. 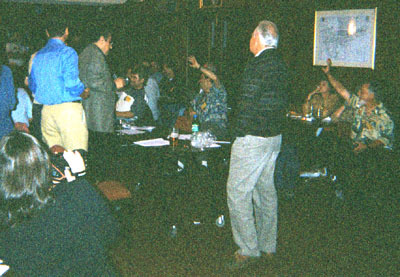 Gary listens to the start of the auction of memorabilia that he supplied to help BtP. Nearby, Stefano, Salvador, and Antonio.